Overalls, or dungarees as I am used to calling them, have been a fringe trend for about a year. And I mean super fringe. You might know the bib-front style all too well because you wore dungarees as a child. They’ve been coming through in casual farmer-esque denim, as well as dressier leather, pleather, silky fabrications and drapey polyester blends. Some styles are oversized and some are tailored. The point is to wear dungarees with a relatively thin under-layering piece, fluid or fitted, sleeved or sleeveless, solid or patterned. If you like you can also layer a topper over the whole lot. The pictures below are great examples of the look. The overall effect of dungarees is casual, and especially so when paired with a tee and sneakers. That way of styling the piece is my least favourite. I much prefer the dungaree vibe when ladylike, girly and dressy elements are added into the mix, like heeled boots, refined pumps, elegant sandals, dressy bags, arm candy, cascading long locks and lipstick. To my eye that’s a more fun and fab juxtaposition of elements, and new way of wearing the item. Simple, bright and very polished. I love the pointy toe pumps and addition of the blazer and structured clutch. A beautiful outfit. Fashion forward, chic and elegant. The narrow cut and dressier fabric of the dungarees makes all the difference, as does matching them with dainty shoes and bag. Genius outfit. Midriff-baring with a pile of pearls, red nail polish, and mirrored shades. Cute deluxe. Round shouldered edge with structured bag, pretty points and long coat. Fabulous. Oversized and rough around the edges with classic hat, flowing topper, and bejeweled wrists. Creative and different (I’m ignoring the flip flops). The downside to wearing dungarees, and any style of jumpsuit or romper, is that they’re impractical in the restroom. A deal breaker in itself. At least with dungarees, you keep the top part of your body warm with the layering piece. I’m not actively searching for dungarees at all. But if a dressier pair crossed my shopping path, I’d be tempted to try them on. They’re a fun piece that can be worn with a dressy support act that makes them look more sophisticated. So for that reason, I’m in. Over to you. What’s your take on overalls and dungarees? 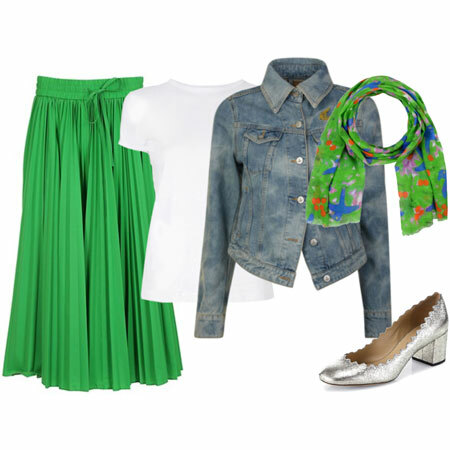 Cute and fun look! I like them (called overalls here in southern US) with heels or booties and some statement jewelry. What a blast from the past for me. I wore overalls in college and LOVED them! My mom – not so much. Of course they weren’t styled at all but that wouldn’t have made a difference to her I love the styling in the bottom picture with the long cardigan and leopard socks. Thanks for this post Angie! So very not for me – the restroom thing is the deal breaker! I wore overalls in junior high, and then again in the 90s … and now this is a “never again” situation. Not that the outfits aren’t cute! They are definitely very cute! Like pil, been there and done that…with flannel shirt and work boots in jean and in green corduroy it was a fave comfy look for uni. Think I’ll pass this time ’round! Just too casual and shape surrendering. I’m seeing a lot of these in the shops aimed at a younger set, but they are mostly of the denim, casual variety. I’m not a huge fan of that look, but I love the first two Pinterest pictures with a dressier vibe. I feel too old for these, and as they are not work appropriate, not sure I would ever wear them. My DD has at least three pair of these in varying colors. At least hers have snaps at the legs to make using the bathroom easier. I wore overalls in high school and college. I saw a pair on the hangar the other day at the thrift store. Hmmm maybe ill go back and try them on. I think i have struggled with figure flattery in these before but if the fit made me feel fab id consider some. Really…i think if i find the right item i like for my figure flattery priorities (& comfort requirements) there isnt much i wont consider having fun with for a few seasons. Like Laura – been there and not for me this time around. I have a pair of denim oversized short overalls I wear to paint in and that’s it for me. Angie – I can see you sporting one of these in a fab way with the Okalas. I tried to wear them in high school. But for me, because of my longish rise, they are extremely uncomfortable as well as impractical. So, while I really like your first link, especially (so much fun with the pops of red!) and while I’m not against them in theory, I won’t be rushing out to try this trend and will enjoy it on others. I wore and loved them in high school (and even college). And I think I’d wear them again if I found the right pair. But I’d probably look like I was working in them. And, I probably would be. I’m giggling because the google ad in the sidebar switched to a Home Depot ad for me on the front page. I’m sure it’s due to the overalls pic! Love these in the dressier, slimmer incarnations- on others. Can’t imagine they would be practical or flattering on me at this point. I will enjoy the look vicariously. They look so cute and fresh here – but so not for me (age, life)! They’re okay. I don’t really see the point/practicality of them unless you’re a potter, cook, etc. Wearing your apron all the time. I can’t stand straps falling down so the first one looks as though it might not do that. OTOH, that makes it look like it would be struggle to get out of to use the toilet. If in fancier fabric, then looks affected to me. As does the one where the flap is worn down and showing. Since, though, there’s a sea of people with half tucked tops, I guess this could be next. Love denim overalls on my daughter and the non-denim ones on the models shown here (the Hatch ones would be my choice and I love your second linked outfit Angie), but the bathroom factor is a deal breaker for me. I wore these in high school, but now I will leave them for the youngsters. Not my cup of tea. You know, I never wore them, ever. Even when they were popular when I was in high school and college. I’m not sure they play well on a bustier, wide-hipped figure, for one thing. But somehow they just never appealed to me. So even though I do like the look in that second link, I seriously doubt I’d go there. If I ran across a streamlined pair like those, perhaps I’d try them on, for grins, but I’m just not all that interested, especially in the denim ones that just remind me too much of farmer wear. I’m a no for this one. I sported this look in the 80s, except then you only wore one strap/side attached to the button/hook, the other side hung loose. I’ll wait for another trend that catches my eye instead. I think my boyfriend jeans give a similar vibe to this look so that will be my nod to this trend. The 90s are back. I wore overalls in high school and loved them. They were a soft denim with wide legs. If I wore them now, a tapered leg would be key. But they are impractical for my life. I could only wear them on weekends and they’re too much of a statement piece for that. Given that my weekend capsule is pretty small, I’d end up having to wear them all the time. People would probably be asking,” She’s wearing the overalls again?” I’d rather add something that plays at mix and match better. you’re spot on Angie in that execution is all of it. I might be tempted to try one too if I can make it look polished. I keep thinking of pin striped dungarees. I would go for that. I’ll enjoy the look on others. It feels fussy and young, although I remember some older women pulling these off in an arty way back in the 90’s. having a figure with curves would help give the feminine edge it needs. Wore these in highschool and college in the 80s, so I’ll pass on them as a fashion statement. OTOH, I’ve been thinking for over a year that I should get a real pair to wear in the garden and for field work. I probably will, but not these floofy fashiony kinds, the real carpenter kind. These are really cute. The tapered leg seems to help make them a lot more flattering. That said, I’m like Janet. I’ve never worn overalls. They’re not really my style for fashion. But, if I had to milk a cow, or crawl under a car, I’d want a cute pair like these! HAHAHAAAA! I own a pair of these! From circa 1993! It’s one of the last remaining traces of my youthful wardrobe. I keep them for housepainting, but in the 90s I wore them for fashion and loved them. Man, you know you’re old when you see a trend come full circle and you were there (and fully participating) the first time around. I don’t think I can wear them for fashion again. I have the figure for it — this an example of a garment that really works on short slim body — but they are too fringe for me now. And too casual. I’ll keep them as paint pants. I still think the denim ones are sort of cute for young women, though. But the leather ones horrify me. I’m not sure this would work for who I am today or my style goals. Junior high yes. Even in high school I did not own a pair though they were still very popular. I think these are cute outfits though. Like many others, I’ve worn them as a child and as a teenager, and i think this style looks best on people this age. But on them it can look very cute! So – not for me this time around! I still have mine from college, and I sometimes wear them for certain costume events – my husband finds them quite attractive, the oddball. Mine are quite battered and patched, and while it may not be Fashion!-updated, I wouldn’t wear the new versions as they appear they would bind. Oh please let these stay super fringe. I have a super poison eye for them. I had my share in the 90’s and I would rather never revisit them. I had some as a teen and early twenties and loved them. I really like the examples you are showing but I don’t think a pair will enter my closet any time soon. My daughter (21) has been loving the resurgence of overalls, and I love them on her. But on me? No thanks. Like many others, I’ve already had my share. I will definitely be leaving this trend to the younger age group – but will admit I quite like the first two outfits you have shown here Angie. I wore them a ton in high school and college. I had a classic pair, and a feminine fitted pair by the brand Dittos that I got a lot of compliments on, so I get where you’re going with making the look more feminine. I loved them. I have seen some made by vintage reproduction companies that I think are cute, but they tend to be more fitted to an hourglass shape and made in dressier fabrics or darker denim. I have also seen jumpers/overall-dresses with a 1940s vibe that I found quite attractive, but I still am not sure about wearing them myself. I’d like to give them a try, but there is a chance they would look a bit foolish on me. I don’t much care for the baggy, denim, bib-style overalls. They seem uncomfortable and not very polished. Lots of interesting thoughts on dungarees. Laura, high five. I wore dungarees as a child in the ’70s and then again in the ’90s as a 23 year old. I wore them int the ’90s too! Particularly when I was pregnant with my first child. I think this look is cute, but definitely not for me. Personally I have a SUPER poison eye for the look, only surpassed by my distaste for Snowmobile suits or Tyvek HazMat gear. But if they rock your boat have fun! With so many other wonderful options of things to wear, I can’t imagine why someone would choose overalls. Sorry, I guess we are allowed to have poison eye for a few styles, right? It’s hard to be taken seriously wearing overalls, unless you are out working in a field. Sort of cute on the right person (younger, smaller). I confess to owning a pair of cut-off denim overalls that I wear for gardening and the like. But I’m from Nebraska where these are authentic hard-working gear worn by farmers. I kind of feel that it’s disrespectful in some way to wear these as a “fashion” statement. It’s also why I will never wear camo print anything because Nebraska is a big hunting state and people wear camo for hunting, but also as some “fashion” statement kind of like that What Not to Wear participant about a month ago. One can get camo overalls here. I wore these when I was pregnant with my daughter in the early 80’s. I got them in the J.C. Penny men’s work wear section. I looked like an old big bellied farmer. I had my time with them and recall wearing a really cute fitted red and navy striped three-quarter sleeve tee with my dungarees. As with many of the other comments, the deal breaker is the bathroom issue. Love your styling ideas for those who can enjoy them. Grown-ups should dress like grown-ups lest they look silly. And how about the one whose bib isn’t even done up? Reminds me of one of my boys who never had time to get dressed completely before running off. Well, I never wore them the first time round and I won’t be wearing them this time either; no sireee. I will just enjoy the look on others. Heh. The last time I wore overalls was when I was pregnant, in 1986! And they were PINK!! I think I’ll give ’em a pass this time around. YES! I’ve always loved them, have had many versions. I recently chopped the legs off the ones I have now. I would like to find a new pair with narrow legs. Wow, you’ve found some great dungaree looks, Angie. I wouldn’t have imagined they could look like this. They are not a trend I’ll invest in at the moment, but I know never to say never. Like you, if I saw an interesting pair in the store, I’d probably try them on! I got a chuckle out of this post. I have a bib front dress (or is it a jumper?) in beige canvas-type fabric that I bought more than fifteen years ago. I pulled it out on a couple of days this summer and wore it with a t-shirt underneath and some bright Supergas. I was rather surprised at the amount of compliments that I got on the outfit. I’m wondering if I could style it w/ some heavy tights, booties or some knee length boots for the fall. Hmm, I might do some try ons at home this weekend and see how it works. I skipped this look in the 90s and I’m skipping it now. I am too old and too curvy for this look. They would be simultaneously infantilizing and frumpifying – not a winning combination. Not for me. I wore them in the late 90s as a child, but now they don’t suit my body type or lifestyle. I think the examples you’ve picked look fashionable (as opposed to frumpy, which is how denim overalls on an adult often come off), but to my eye it’s still a very youthful look. I’ve always had a soft spot for overalls (and jumpsuits) and would definitely consider wearing a tailored pair again paired with ladylike support acts. Love all these visuals. There’s just something about dungarees and overalls that makes me smile. 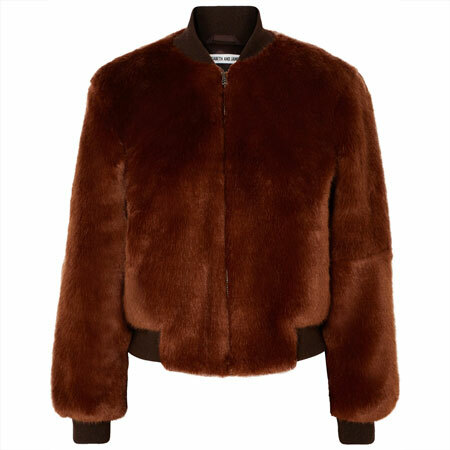 I’ve been eyeing a very polished version from Club Monaco but I’m really not sure they’re for me. This past summer, though, I found myself in love with a few jumpsuits and rompers, not something I’d ever considered wearing before. I think overalls, even of nice wool suiting fabric like the Club Monaco pair, would make me look too young. I saw many versions of overalls in the 90s when I was at college. But I don’t think I want to wear this style any more now in my late 30s. I wear the farmer type at home while working in the yard and they are very comfortable for that. I wouldn’t wear them as a fashion piece. That just seems wrong considering how unflattering they are, BUT, you have shown some tapered and fitted ones that would be interesting on the right woman in the right place, and with the right supporting pieces. I wore them all the time until I was maybe ten years old. I had ones with long legs and also ones with short legs for summer. 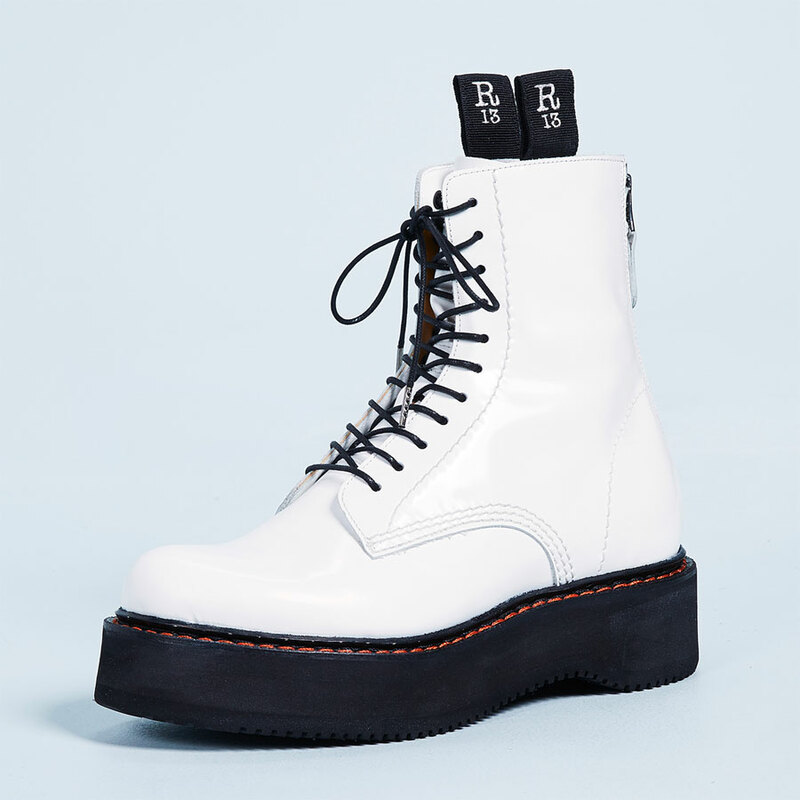 I always thought they weren’t for grown up me when I saw them somewhere after that, but I’m now thinking I’d wear a pair if they were flattering on my figure. Echoing Parsley – wore them in high school and have had my fill. Time to move on, and enjoy the look on others. Not for me! I wanted to talk about this being one of the few items of clothing that I feel “too old” for, but then I realized that that’s probably not even the main or only reason. I had one pair of mustard colored corduroy overalls in my youth, but otherwise haven’t even been big on them in younger days. If I could get over the impracticality aspect (which I can’t), I’d rather go for a jump suit than an overall. The bib part is just not my cup of team. Of the images below, the ones I like best are the first couple, where the bib is almost morphing into a top part of the garment. I really dislike the leather/pleather versions: they look like mud pants to me. Sorry, don’t mean to offend fans of overalls, really! It’s just my personal taste and I’m sure you, Angie, and some other dare devils will rock your styled versions. I still have my old cut-off Farmer Johns from the late ’60s/early ’70s when I was a teenager. Somehow I missed the trend in the ’80s and ’90s. We wore them as camp counselors/CITs (counselors in training). I think I kept them because they bug my mom so much. And since I still have mom issues (at the age of 60! ), I think I still might wear them in front of her — but only in front of her. Although everything is a few inches lower, my weight hasn’t changed all that much so I could probably still get into them, LOL. But as to the other iterations? The bathroom thing is so annoying, and I don’t want to risk the cell phone landing in the wrong place, so no thank you. As several others have shared, overalls were something I wore all the time in high school, so I won’t be wearing them again. The outfits are cute, but they still look “young” to me. I thought they would be cute on in the 90s, they weren’t. 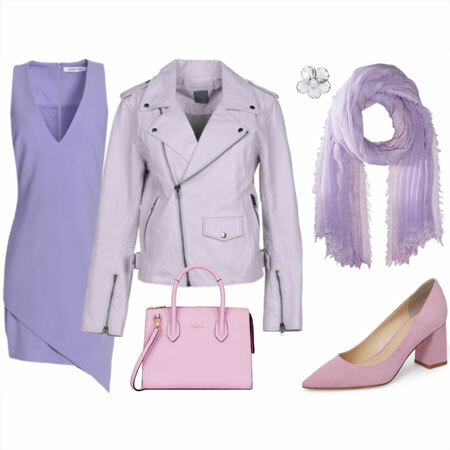 I love this look but am definitely too old to wear it… darn! Also the bathroom issue would cause problems when I’m playing competitive bridge. Perhaps I’ll be able to get a somewhat similar effect with jeans, a vest and a tee shirt. They are not for me. I think that they are better suited to tall, slender women. I am neither. BUT, I don’t hate all of the looks above. I am particularly taken with the white ones in the top right. They look very stylish and almost like evening wear. Like Nebraskim, to me they (the blue denim variety) are a bit too close to what my grandfather wore in the barn on his dairy farm. This association is also what prevented me from wearing them the first time around. Still, most anything can be cute on the right person with the right styling. Yes, I too grew up in New York where we’d call them dungarees, and it wasn’t until I moved to Delaware that I heard the word overalls. Now I try not to wear either unless they are colored, blue denim is no longer flattering to my figure! I feel gulity but I have a secret love of overalls. I have been debating about buying a pair for the last year. But finding a pair in black with slouch but tapered legs is nearly impossible. Plus I really like the overalls with a y-shaped back too, not just straps. I love the look rolled to the ankle with booties, a tank, black blazer and pearls. It must be my rebellious streak coming out. I have this notion that Leandra Medine of the Man Repeller has single-handedly revived this look. I can’t see myself in these, although they had a moment in the late 90s and I wore them then. But I like the way they look in leather; I will admire them on younger women. I think I wore this look out in high school (late 90s) and I don’t think I can go back. I love this look when done well; but not for me. probably not appropriate for over 60! I didn’t like/wear this trend back in the 70’s when I was young and very thin. I won’t be wearing it now. Ha! I wore overalls as a kid-loved them! I’ve worn them both as workgear and as fashion. I like the very last outfit! Love these – as long as they are paired with girly, refined elements. I’d definitely give them a go if I spotted a pair that was in a dressy fabric and narrow silhouette! Lol on the restroom comment. I wore these in the 90’s as casual wear and as a MOTG outfit postpartum as it was one of the first garments I fit into. They were loose with easy off straps so the restroom was a breeze. This time I’ll pass but I will enjoy seeing them on the fashion forward crowd. I’ve never liked overalls – not when I was 5 in the 80’s, nor when I was a teen in the 90’s, and not right now in my 30’s either. They’re just not my style AT ALL. I loved them every single time they came around – I still have an ancient oversized linen pair that I wear every summer for yard work. If I see the right kind (like the Hatch ones), I would try them again. I have such good memories of my overalls… I can remember each pair individually as if they are old friends. But I doubt I will find myself in them again. Sorry, no styling or pose from a model can change the fact that they are ugly to my eye. I never wore them. Perhaps I am too short. But – No matter what the figure, no matter whether the leg is tapered or not. You are wearing a BIB across your chest. And having something like that attached front and back to your britches, lol , is ugly too. Oh, forgot sometimes it is hanging down and flopping while you move. ( I think I can even remember this and hearing the buckles clank on things , lol). Overalls in denim, pleather or mink,, YUCK. 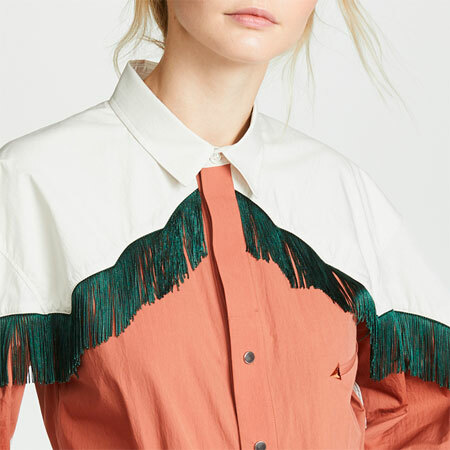 And to see it mainstream if it takes hold would not be good,, just like the midriff fringe trend I keep hearing about.. Sorry! if you love it , go for it ? Angie, I do hope you find a pair of overalls that suits you. I think you could totally rock a pair of denim overalls with a biker jacket and your doc martens and your punky hair…it would be killer! I so remember this trend as a teen in the 90’s! There was an older girl I idolised – she rocked a pair of baggy dungarees and a tight black body suit and a cute bowler hat and a spiral perm and I WANTED to be her. I had a pair of dungarees myself which I wore to death, but I don’t think I ever looked as cute as that girl did! This is a blast from the past. I wore dungarees as a teenager with one shoulder strap done up and the other hanging loose. They are also somewhat reminiscent of a maternity pair I had! Jjsloane, Okalas are the way to go. I wore overalls in college and loved them! I would love to see DD in a pair of sophisticated ones. What a fun look! Held on to my overalls and thinking the rolled up denims with the booties is a perfect weekend look, lets just hope they still fit. 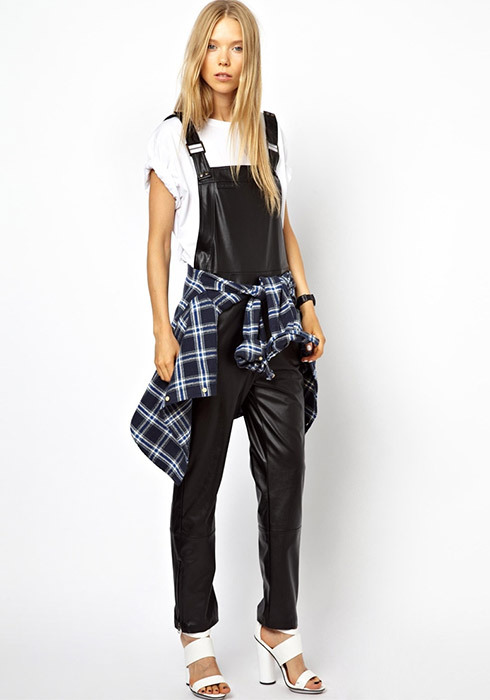 Not much a fan of the overall/dungarees fad……reads a bit too “Hee Haw” for my aesthetic. Cute for the young women. But oh so wrong for me! I like them. I don’t think they are only for young people. I think we can still rock them but we need to wear them with the right top, shoes and accessories. Trendiness gone horribly wrong! Oh dear me. Perhaps cute look on an eleven year old, though. I’m chuckling at some of your comments. I wore overalls in high school, but today they are not for me at my age. Let the younger generation enjoy! On tall and young women, the tailored, non-traditional versions look … okay. Beyond that and IMHO, in denim they only belong on babies and old farmers. Yikes! I write again from a rural area, where it’s hard to wear them with irony. I see the virtue in urban street-wear, especially with elegant heels and super bag, but my hope is that they’ll stay very fringy. Anyway, I wanted to ask that, if you were to try that style, how would you ensure the dungarees stay up (& don’t pool around your knees)- especially if they’re a baggy design? Even the tall, thin models can’t make this look good. I’m thinking a self-respecting nine year old would even take a pass. I’m having flashbacks to the Come On Eileen video and Dexys Midnight Runners on a street corner wailing too-ra-loora-too-ra-loor-EYE-AYY!!! Hey, what if it was a bib overall with a skirt instead of pants? I had one when I was a kid that I wore to death-it would solve the bathroom issues!